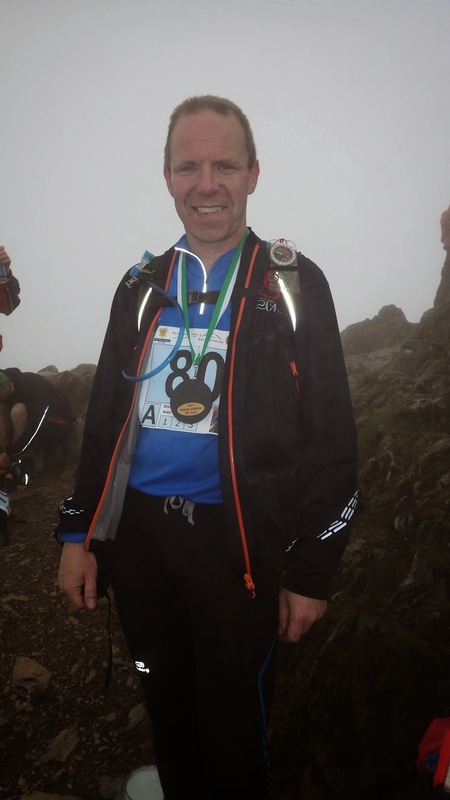 Another iconic race which I have been aware of for some time; this was the 43rd edition of the Welsh 1000m Peaks Race. The race has been going since 1971 and has had its fair share of controversy including the death of a competitor several years ago in a fall from an exposed ridge which led to a course change. 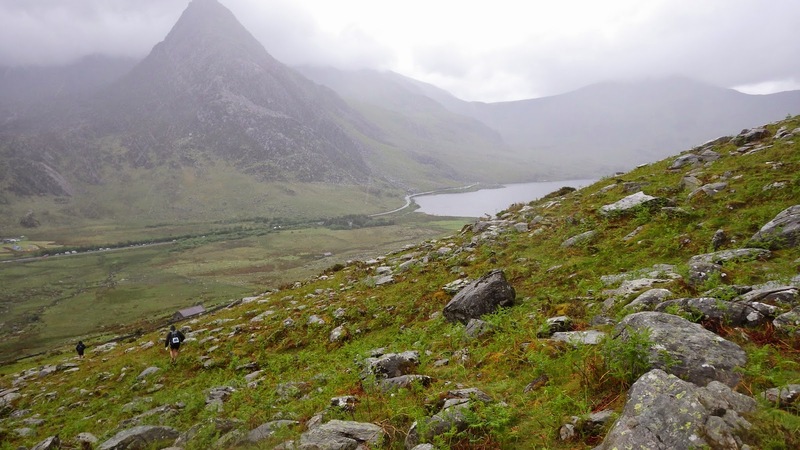 The race is held on the first Saturday in June, starting on the coast at Abergwyngregyn, climbing up and over the five mountains over 1,000m altitude in North Wales before finishing at the summit of Snowdon some 20 miles and 3,000m of ascent later. Not for the faint-hearted this one, as there is no waymarking and competitors are required to bring their own maps, plotting the coordinates of the checkpoints themselves then navigating from point to point with a number of compulsory routes between out-of-bounds areas. The usual long drive to an event area took place on the usual Friday afternoon with the usual traffic conditions. Nevertheless I was at my chosen campsite by around 7pm and was able to pitch my tent and relax with some easy camp food Lidl-style! This consisted of smoked salmon and mussel chowder, followed by chicken tikka masala and a luxury tiramisu. All went down rather well and cost barely a fiver! I almost managed to spend a whole night in a tent in Wales without it raining! 15 minutes before I had to get up at 6am the heavens opened and the tent took the inevitable deluge well. Breakfast, wet tent packed away and then it was time for the 20 minute drive to Llanberis to register and receive my electronic chip ‘dibber’. The scene was set for the potential weather conditions on the day when a thunder storm hit at around 7.30am taking out the power in the hall. Kit checking in the dark followed before I boarded the bus to the start. 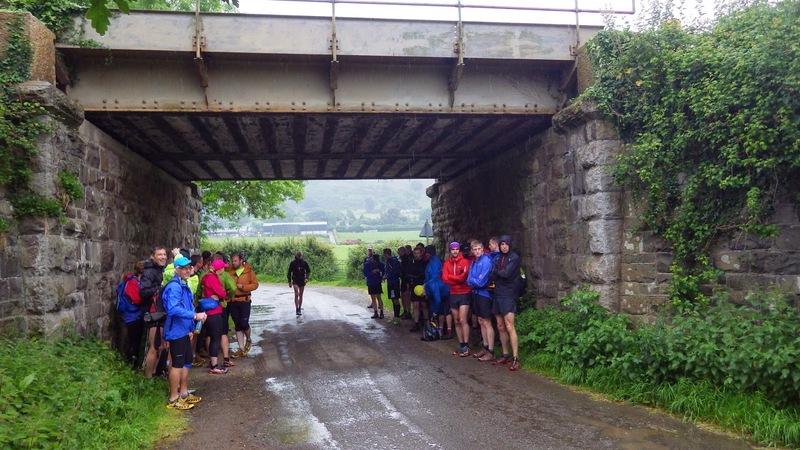 The organisers were rather concerned about the conditions and the briefing focussed on what competitors should do in the event of an electrical storm while up high on one of the exposed ridges which featured heavily in the route after the first few miles. ‘There is no point cancelling the event because of something which may not happen’ said the race official and this was proved correct as I saw no more lightning for the rest of the day. 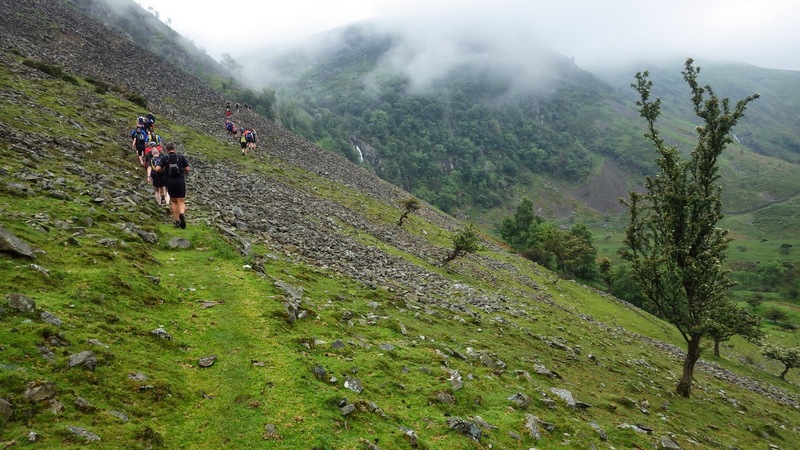 At 9am around 120 people in the ‘A class’ – (fell runners 5 peaks) set off and began the first ascent from sea level up to Aber Falls. After an initial burst of speed along the road section people stopped off one-by-one to remove waterproofs and extra layers. It had stopped raining and become very humid. Most people were down to one layer now with the rest safely stowed away in their rucksacks. 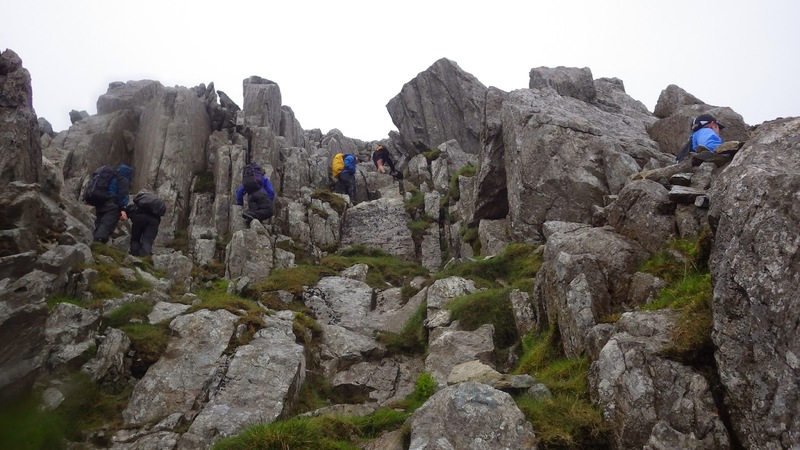 The section up and past Aber Falls became quite technical and single file before the terrain opened up into a long climb up to the first checkpoint at Foel Grach. From here the route to the next checkpoint took a long and steady climb up towards the ridge near Carnedd Daffyd then an out and back of around a mile each way to the summit to ‘dib’ the control. Unfortunately this is when the rain started again. It quickly became heavy, then heavier still. After a couple of minutes the intensity of the rain was such that you didn’t think it could get any heavier but it did! Torrential really is the only word to describe it. 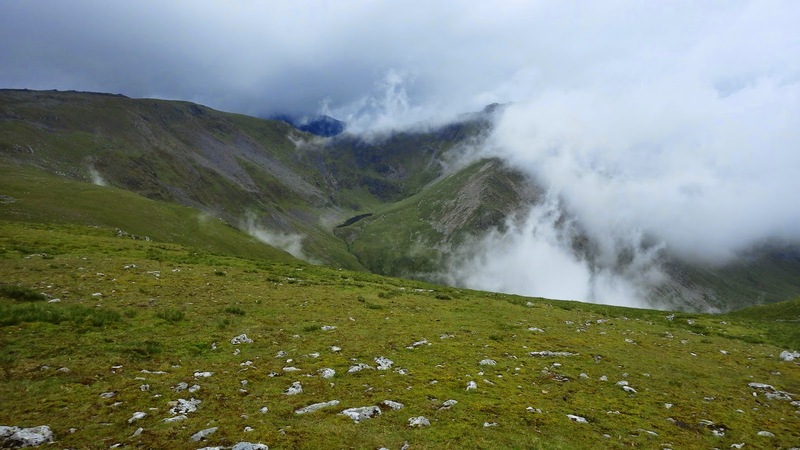 My pace quickened in the rain – I really didn’t want to be up there if this was the moment that the storm decided to return. Checkpoint cleared and the rain stopped after half an hour or so. Descending into the valley at Ogwen the temperature increased and I grabbed a couple of flapjacks and a banana from the aid station before continuing. The next challenge was an ascent of Gylder Fach before dropping down into the valley at Pen-y-Pass for the last aid station. At this point I made my one and only navigational error which meant I descended too soon and ended up faced with a 10m high cliff with no way down. Some extra climb and an additional 20 minutes added I reckon. After Pen-y-Pass came the final gruelling climb of Snowdon following the Pyg Track. A marshal at the aid station helpfully said that the remaining distance was only 3.75 miles – not too bad I thought. ‘It’ll take you a couple of hours though’ he added – bugger! He wasn’t wrong. The Pyg Track is like a never-ending staircase of helpfully placed slabs of rock marking out a path of sorts. The main problems with this ascent were the tiredness I was feeling in my legs and the hordes of tourists everywhere, some ascending but mostly descending, taking their time about it and generally getting in the way. This meant that often the best line to take up the mountain to avoid a stationary queue at a tricky bit was to take a wider and more exposed line nearer the edge and the increasing drop down to Llyn Llydaw and Glaslyn lakes below. Fine on a leisurely stroll up to the summit but rather annoying on a long timed climb after 18 miles running and walking! After what seemed like an eternity I neared the marker stone at the top and peeled off to the right to collect the last checkpoint at Garnedd Ugain before retracing my steps and heading up to the summit of Snowdon and the finish line. 7 hours and 20 minutes had passed since the start. An hour longer than I had (roughly) planned but I had done it and received a rather unusual slate medal as my reward. Once completed there was the small matter of descending some 6 miles down to Llanberis to collect my car before beginning the journey home. I had been warned about how quickly you cool down at the top of Snowdon and how important it is to take extra layers. 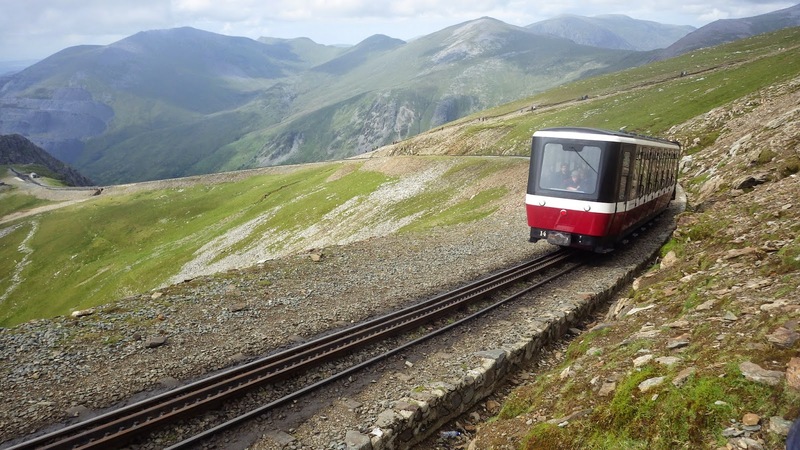 This wasn’t a problem today though as the summit was blanketed by a warm mist of cloud (and body heat from several hundred tourists in hot pants and stilettos – bloody mountain railway!). It seemed rude not to jog down the mountain so set off with another guy and proceeded to jog down by the side of the railway track for the first couple of miles. At this point I bumped into my friend Simon ‘having a rest’. Clearly the extra energy he had used finishing ahead of me had left him tired and we walked the next bit together, stopping off at the Halfway Café for a drink and snack. ‘So, is this place exactly half way then?’ said Simon to the lady behind the counter. ‘It is on the way up’ came the reply!! Still not quite sure how that works! Another memorable day in the mountains and one I would recommend to any runner with a sense of adventure who fancies a challenge. As the saying goes ‘I’ll be back!’. This entry was posted in Uncategorized by smilersteve. Bookmark the permalink.